CCS Alyar is a 5 year old leopard mare bred by Cedar Creek Stables in Virginia. She currently stands 15.2 and is a substantial bodied mare who will support riders of all sizes, while still compact and light on her feet. This youngster is naturally uphill with a top quality canter. 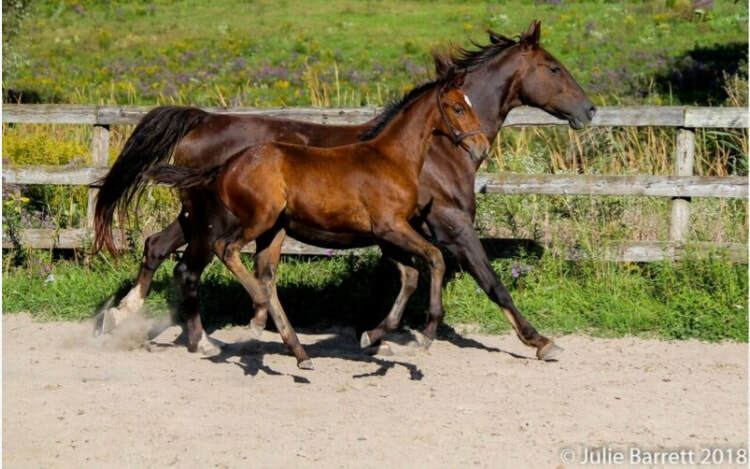 Aly is by Knabstrupper stallion Halifax Middelsom out of Beebe, a Swedish Warmblood mare by Briar. As a foal Aly was competitive on the line at the prestigious Dressage at Devon horse show, and has just recently started her performance career under saddle. She has a several shows under her belt in both Canada and the USA with good scores at training level. Aly is an incredibly quick learner and currently started on lateral work, lengthen and started over poles and small jumps. She hacks well and is absolutely suitable for an amateur in a program despite her young age. She has been used in lessons for older amateurs as well as juniors. She will be an all-arounder for any discipline but will absolutely excel as a dressage horse. Vanya is a loudly marked Knabstrupper mare, bred by Cedar Creek Stables in Virginia. She is as sweet and friendly as she is striking. She is by Halifax Middlesom, Knabstrupper stallion, and out of Rigantonia Annastasia Bonita, Hannoverian mare of the Rubenstein line. Vanya is registered with KNN and also approved breeding stock who has already had one foal. She is an elegant, comfortable mover, with a super jump as well. As a youngster she showed on the line at Devon, and did the Young Horse Series with ribbons and success, and even jumped under lights. She evented up to novice as a 4 and 5 year old and was a solid performer with regular ribbons. She recently did her first Canadian dressage show, winning both her tests at 1st level with 66 and 67. She also performed in the Spirit of the Horse ring at The Royal Winter in front of large audiences, and was a huge hit with non-horsey and horsey spectators alike. Vanya's future is bright for virtually any discipline. She is quick across the ground for cross country or jumpers, is jumping in super form with easy changes, and has the brain and work ethic for dressage. She is very sensible and not spooky and is absolutely suitable for an amateur rider. She is also an asset to a breeding program. Laren is a 5 year old dutch harness horse. He is friendly, sweet, and has super gaits to excel as a jumper, eventer or dressage horse. Scandalous is a typey elegant filly by Lindegaards Elliot, KNN lifetime approved imported Knabstrupper stallion. Scandal is out of Sartors Jet-Set, a premium Knabstrupper mare, also imported. Jet-Set is by Danish Warmblood Blue Hors First Choice (Jazz) and is half sister to Sartors Showtime. Scandal is a super mover with excellent hock action and will be a contender in any discipline, and should finish 15.2-16.1. With the Knabstrupper's excellent brain, she will be suitable for an amateur or professional. 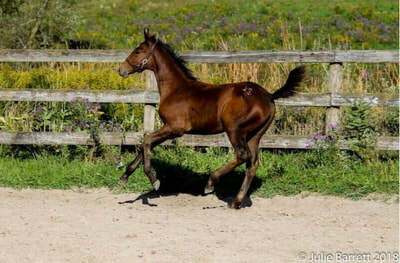 While born bay, she carries the LP gene and will be an excellent addition to a coloured sport horse breeding program. She will varnish as she ages and is already showing lots of white hairs in her foal shed. She can be registered KNN or CSHA. She is pictured at 3 months. Asking $12.5k Canadian, negotiable to a quality show home. Board until weaning is included. 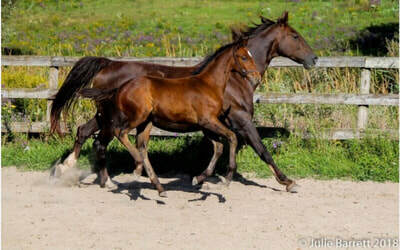 Tall big moving filly by Lindegaards Elliot, KNN lifetime approved imported Knabstrupper stallion. 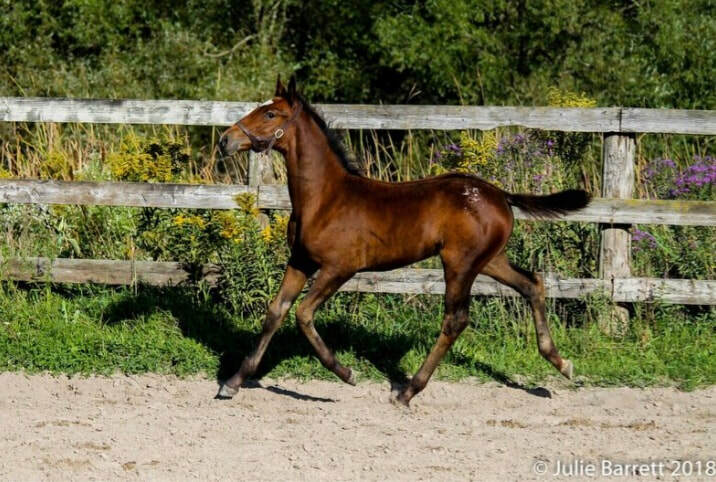 Glam is out of Celona, KWPN dutch harness mare, approved for breeding by the KNN. Mom is a big bodied 16.3, so we expect Glam to finish at least 16.2 if not larger. Glam has the level headed Knabstrupper brain with the energy and action of the dutch harness. 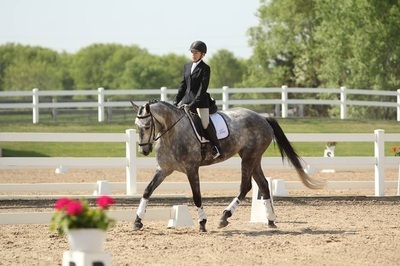 She is a shoe-in as an upper level dressage horse, and likely to have her daddy's amazing jump. In addition to being a riding prospect, she would also be pretty impressive in harness. Glam was born bay with a small frosty blanket over her hind quarters, and with the LP gene she will colour out as she ages. She can be registered KNN, KWPN or CSHA as per her buyers request. Asking $12.5k Canadian, negotiable to a quality show home. Audacious is a big strapping loudly marked colt by Lindegaards Elliot, KNN lifetime approved imported Knabstrupper stallion. He is out of Elegance, a big impressive KWPN dutch harness mare, approved for breeding by the KNN. This colt is the whole package; good moving, sensible, and very personable. He can be kept in tact as a stallion prospect or gelded after weaning. He is eligible to be registered either KNN, KWPN or CSHA. Asking $20k Canadian, negotiable to a quality show home.